I finally got my very own copy of my friend Lani Wendt-Young’s recently released book, “Pacific Tsunami – Galu Afi” (specially hand delivered by James “Gyme” Atoa -Thanks bro!). I haven’t had a chance to read it yet, however, I did read the forward by Head of State, his Highness Tui Atua Tupua Tamasese Tupuola Ta’isi Tufuga Efi. His Highness has had his share of vociferous critics over the years but I admit, even with those criticisms I’ve been a long time admirer. He has an incredible command of the Samoan language, his depth of knowledge of Samoan culture, the intricacies of our customs and the eloquence by which he divulges this information to anyone who would give him an audience make him, in my mind, a national treasure and a natural well-spring of wisdom. Lani Wendt-Young has been an acquaintance and friend for many years, spanning back to our days in Pesega. She is the daughter of Mrs. Marita (Johnson) Wendt and Dr. Tuaopepe Felix Wendt, an educator and another one of my many childhood and adolescent hero’s. You may have also honed in on that recognizable surname. Her uncle Albert Wendt is a renowned author whose accolades are very well published. I won’t dwell anymore on that because if you don’t know who Albert Wendt is, you don’t know much about Pacific Island authors and that’s a story for another time. Instead, I’d like to focus a bit on Lani. After all, this is her very first book and I’m eager to delve into it. Lani is quickly becoming an accomplished writer. Her short stories and fiction have been published in Samoa where she currently resides with her husband Darren Young and their five children, in New Zealand and Australia. In our last correspondence she mentioned that she is working on a fictional novel. I’m not sure when it will be ready for press but I’m sure it will give me at least a little bit of time to get through Galu Afi and write a review. 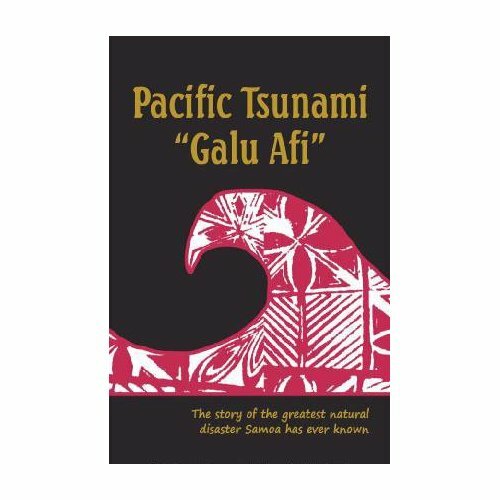 Until I’ve finished the book and written a review, feel free to purchase your own copy of “Pacific Tsunami – Galu Afi”. If you’re located here in the United States, email me your contact information and I’ll forward it on to Gyme Atoa who has been the primary distributor here. Otherwise, you can purchase the book online at Amazon.com. Finally, be sure to show your support for Lani but visiting her blog, or by sending her a Tweet.